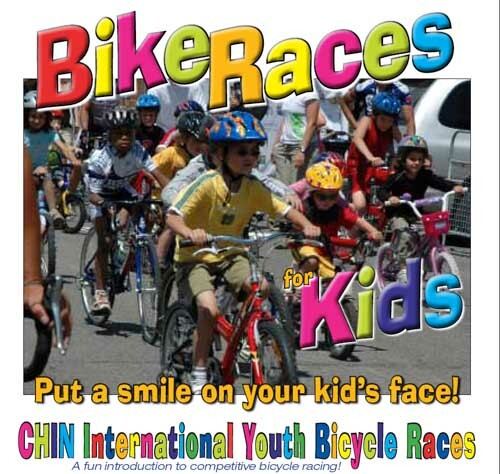 29th Annual CHIN Picnic Bicycle Races, Canada Day, Wednesday July 1st. Returning this year are the Beginners races for youth and adults... These are fun introductory races for those with the desire to test their metal but aren't quite ready to take out an racing licence. Please pass the word and invite all your water fountain and gym buddies to give bike racing a try. As I said they're fun so ANY type of bike works. Helmets mandatory. The crowd pleaser of the day will once again be the Kid's race. These are for kids technically 3 years to 13 years inclusive, but we really don't check the ages too carefully so some 2 years have slipped in. Parents are encouraged to ride with the youngest ones. Once again its a everybody wins event, kids going home with huge smiles. This year we've sent you a pdf of the kid's race poster hoping that you'd email it on to your friends, associates and relatives who happen to have kids that love to ride their bikes. Grand Prix returns to the 29th Annual CHIN Picnic Bicycle Races... $1,000 for the Elite 1-2 women and $2,500 for the Elite 1-2 men and $1,000 for the Master 1 men. First prize for the Elite 1-2 men is a cool, crisp $1,000 -- not bad for 80 minutes of gut busting, heart pumping, exciting bike racing! The big teams will be fighting it out trying to own the podium; $1,840 is the combined 1,2,3 purse payday. Check out the tech guide (below) for full prize breakout. This will be a hard fought race of rabbits, break aways, blocking and everything in team strategy arsenal... plan to say late and see all the action! Note the schedule is not the traditional OCA schedule. It is based on past CHIN field sizes. This year the largest fields race later in the day. Registration/Sign-in Regulations: Preregistration (will be) available on the OCA web-site www.ontariocycling.org , no refunds. All riders are required to sign-in no later than 30 minutes prior to the start of their event. Day of registration: Please add $10 to posted fees. Race day Registration closes 30 minutes before the advertised start of each event. Cash only please. US funds will be accepted at par. Lastly don't forget to attend the Bike Race promo on CHIN TV this Sunday, June 21. Bring your bike, your race gear and your favourite CHIN race story!